You many recognize this Venetian facade as one I paint often ~ and indeed will continue to paint as I find it so very beautiful and rhythmic, with a touch of mystery and intrigue. 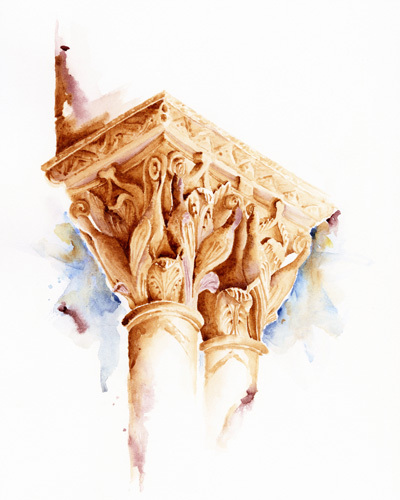 It's one of those places that lends itself to my loose, interpretive way of painting architecture. Shared here is actually one of my earliest watercolors of the palace. Painting this facade, just as painting any other place, is a way for me to celebrate the beauty of a site, my memories of being there, and what I remember most. And so each painting holds the gems of my travel experiences. What is possible, what we can experience, what we know, is all contained within the roof of our lives, our homes, our beliefs. We are called, lead, guided to believe that anything is possible and soon learn that indeed it is. Color of Venezia ~ the above watercolor ~ is available as a limited edition archival print, in my online shop here. If you have traveled to Italy, or dream of traveling there while perusing dreamlike images in magazines or beautifully curated Pinterest boards, you know it is a land of variety. While monuments and majestic ruins are plentiful, so too are the many inviting vistas and the small details one is sure to find along the way. These present themselves at varying scales. One might marvel at the spaces that unwind while strolling through an arcade, or encounter an ancient wall to witness the age of its weathering stone carvings. 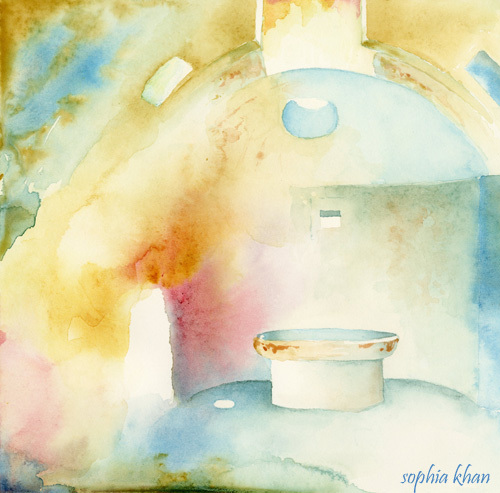 It is with all this in mind that I painted the above watercolor and wrote the poem below. They flash before you like scenes from a mosaic brought to life. Each vista in Italy is both a delight in and of itself, while through our wandering, they become connected by our memory, and thus become whole. 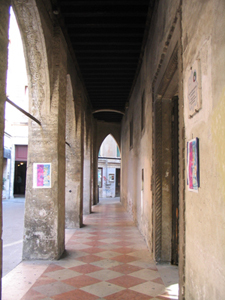 Turning the corner of the arcade leads to the open door in the home. Turning the corner of the Cathedral leads to the closed doors of the forgotten church. The church whose fading frescoes are all that remain to watch it from within, be it in silence and in dark. Laundry drips its thirst onto sunlit stones, creating patterns for the wind to play with. In Italy, what was once private is now out in the open, while public space-the life filled piazza-retains a level of intimacy that is perhaps not even found within the home. For here, the traveler is not frowned upon for wandering alone. Here, the stones of the cities past gently nudge us to reconnect with, rediscover, and bring to the surface, thoughts of of own lives, our own story, our own path. And just as our lives are made up of tiny seeds of memory, that now and then become large or shrink according to the importance we impart on them, so too our travels embed in us many images that remain within us. Now and then, they lovingly remind us of a certain part of ourselves we perhaps found or fell in love with while we were there. Somewhere in Venice lies a forgotten love letter, a handwritten dream, whose lovelorn words give the city a silent pulse. Somewhere within a weathered yet proud edifice, is a story of a merchant from the East who rebuilt his roots and rewrote his story. Such is the romance of Venice; layered by its present, layered by its past, but not needing to look towards the future. For Venice holds dear that which it already possesses, without yearning for something more than it so magnificently is. If you enjoy my watercolors and writing be sure to subscribe to my watercolor inspiration journal here. It is there that I share more travel inspired art and writing, with a wonderful community of art enthusiasts. I would love to see you there.